This vest will keep you warm anytime, anywhere. Lightweight and portable, this vest will make sure that you're kept warm and ensure that you look polished. 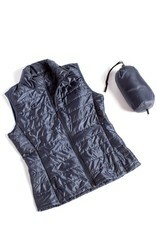 This vest has a zippered front so you can wear it however you'd like.